For those of you jailbroken users that insist on opening up Cydia every five minutes and checking the recent changes tab for new and exciting tweaks, the release of SwitcherCleaner for your jailbroken iOS 5 device will probably be old news to you. By now, you Cydia professionals have probably added this to your list of growing iOS 5 only installations and are enjoying the multitasking house cleaning that it provides. However, for you more laid back jailbreakers, who only open Cydia specifically to search for something or when yours truly writes a post like this informing you of a new tweak release, you may be interested to learn of developer r_plus’ newest tweak. Whilst not being one of the well known ‘household’ names in the jailbreak world, r_plus has quite an extensive list of releases behind him with some of the more notable being Lock Calendar SBSettings Toggle, ActionMenu Wikipanion, GrayScaleIcons, AutoScroller and BackForwardEnhancer. As previously mentioned, the newest release to be added to the developers arsenal is an iOS 5 only project called SwitcherCleaner which makes itself at home by providing users with two enhancements to the native multitasking switcher area. First of all, when accessing the multitasking area on the device, only running applications will be visible. In the native operating system, a user would need to press and hold on an icon to enter editing mode, which in turn activates the familiar red ‘delete’ option allowing the application to be removed entirely from the switcher bar. SwitcherCleaner removes the need for this additional user interaction by changing the default behavior of the OS and setting the setShowsCloseBox boolean to YES. This small change to the default behavior means that whenever the user enters the switcher multitasking area the red delete option will be visible on the application icon, allowing it to be removed from memory quickly and efficiently. As an App Store developer myself, I have always been interested in how developers go about creating jailbreak tweaks and altering the default behavior of Apple’s native classes. The developer of SwitcherCleaner has made the tweak available as an open source project on his Github page here. The below code sample is taken directly from the tweak.xm file and is the command which applies to the delete option to the applications icon. 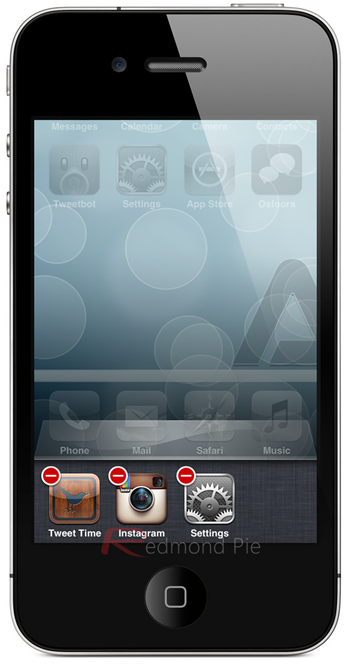 SwitcherCleaner is available now free of charge on the Big Boss repository for jailbroken devices running iOS 5 or above.